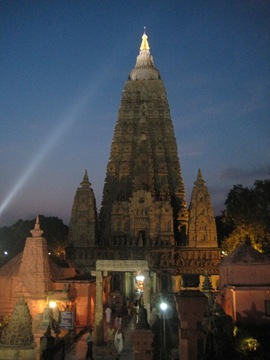 Every morning, people start coming into the Mahabodhi Temple at 4am while it is still dark. 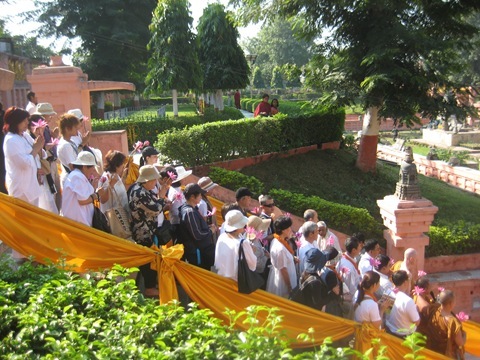 Amazing numbers of people from Sri Lanka and many from Thailand, Mianmar, Vietnam, or even Taiwan. 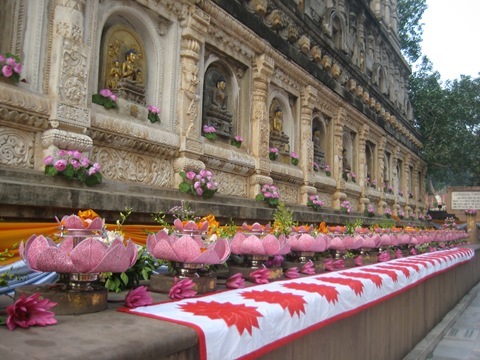 They are so devoted that many of the groups would carry some big offering items together, and some would even hold a lotus while walking towards the temple. 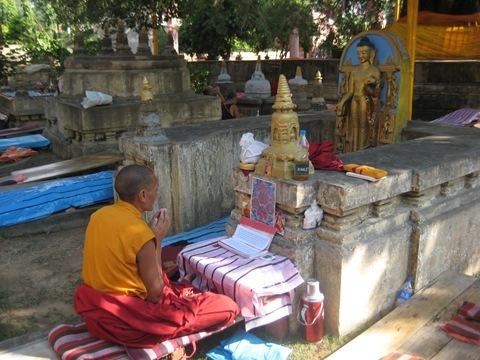 This is a pretty impressive Western Shravaka monk. He always sits in the same spot everyday from 4am till approaching noon time, without moving at all. Though you can never judge a practitioner by appearance, this one is so impressive that you feel joyful by simply looking at him. 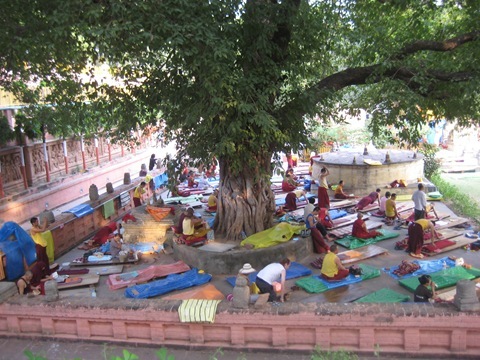 Many Tibetan Buddhists come for doing prostration. 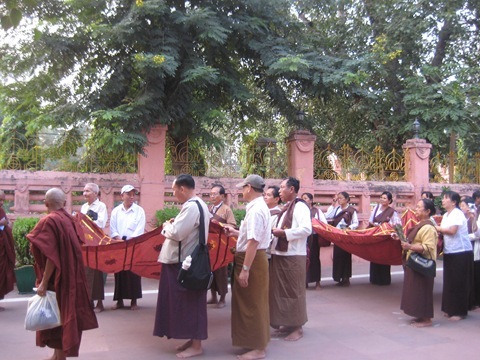 There are a few monks from Ngor Monastery. Though I did not know them prior to the trip, they were very kind to let me use an idle board and even lent me their mattress when I needed. My spot is towards the right end by the small tree in the right photo. I became so gracious after only 20 minutes of prostration. 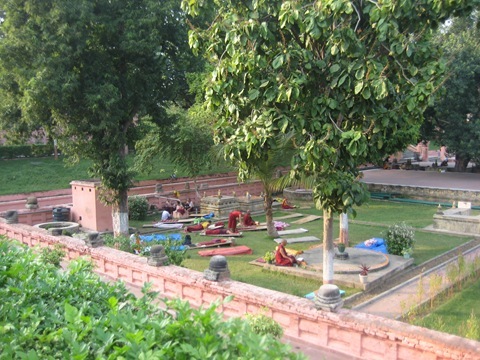 The lamas were really kind to let me do prostration there. Without the tree shade, I probably would not last for more than 30 minutes. This is my board. 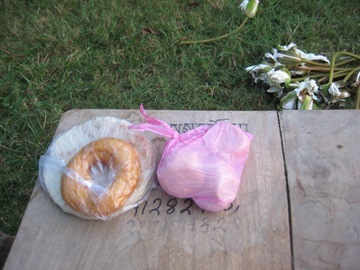 Every morning there will be some people offering breakfast to the practitioners. They would just leave these vegetarian food quietly without disturbing us. 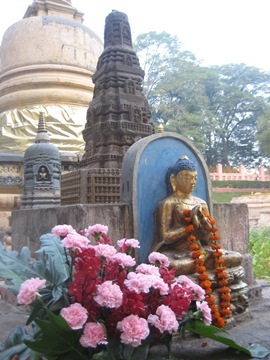 You really feel being taken care of here as a part of the Buddha’s family. 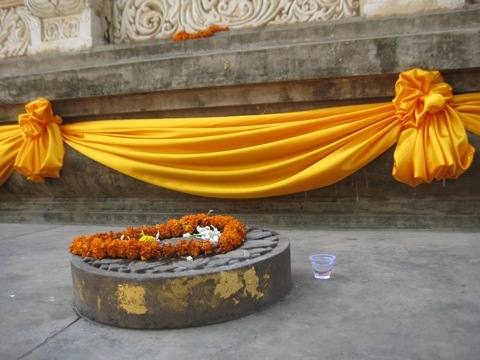 Sometimes I will bring some flowers and incense nearby, just to create an enjoyable environment for prostration/visualization. 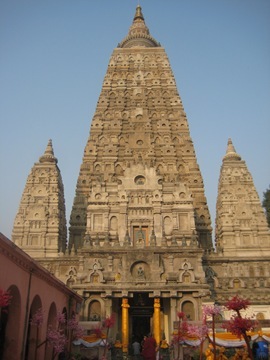 It was such a luxury to be able to see the Mahabodhi Temple and the bodhi tree in each prostration. 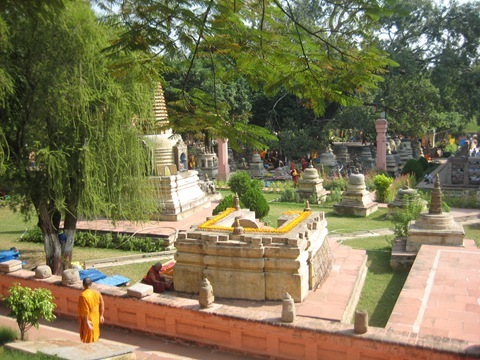 The blessings in Bodhgaya is very obvious. 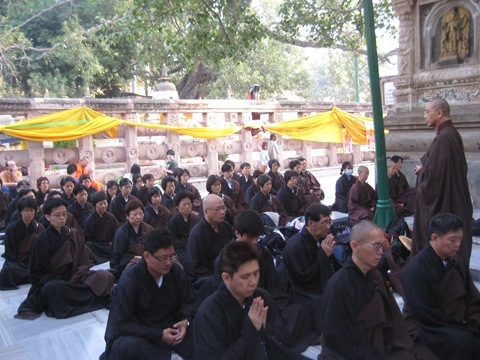 I could usually do only 100 prostrations each time with much of the time resting on the ground, here, easily 200+. So I successfully completed my aspiration of doing 2100 prostrations for the 3 days here, not to mention that I only did it in the early morning and late afternoon when the sun was not too strong. 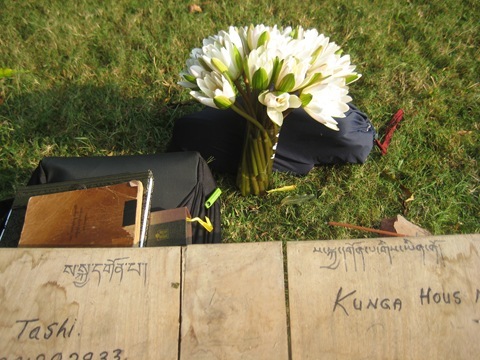 Also, right after the first morning of doing prostration, someone in lunch time told me that Dudjom Tenzin Yeshe Dorje Rinpoche was only less than 30 meters away from where I was. 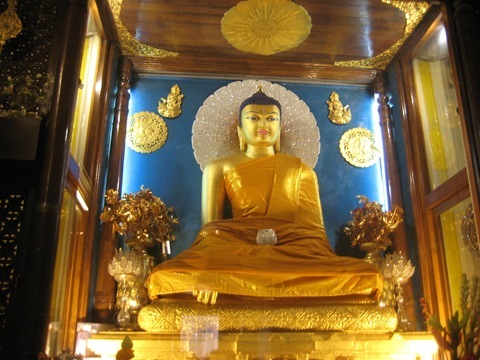 Though I did not know him or even ever see his pictures before, I do feel that Buddha must have sent him to fulfill my wish to get oral transmission of Riwo Sangcho. 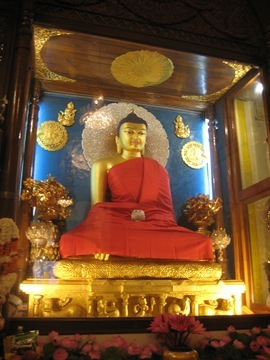 Though a bit hesitated to disturb him, I eventually made the request during his break and got my transmission. 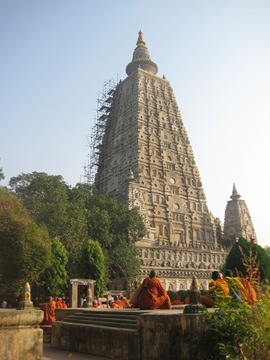 In summary, the blessings from doing prostration in Bodhgaya is just amazingly obvious and swift to come! 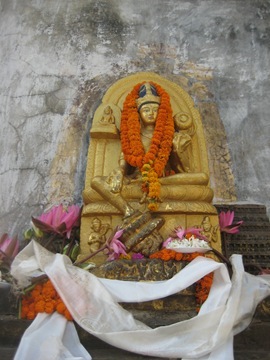 So offerings of flowers, food have naturally been flowing constantly towards the main statue. 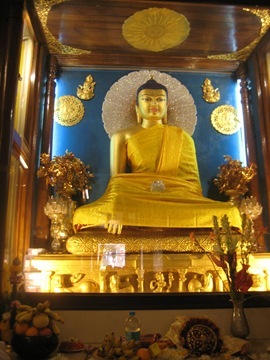 The 195 lama also taught me something new, which is to offer robe to the Buddha statue. 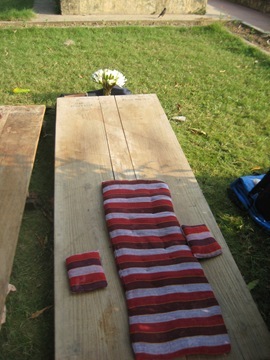 As we did not bring a robe, the office provides 3-piece robe for offering at a mere 500 Rupee. He even got one piece back after the offering, supposed to be a real blessed object. 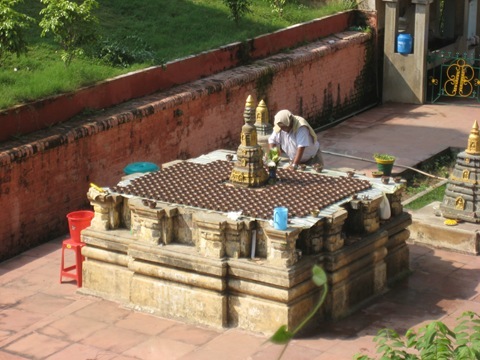 People make offerings everywhere, not only inside the temple, but also outside as well. It can be as small as this mini cup of water. 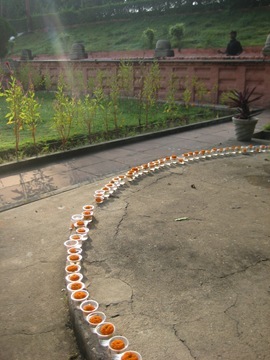 Yet you can feel the sincere devotion and pure intent of whoever brought that small cup, filled it with water, and offered it here. Or like the lama behind me doing prostration, he would lay out a circle of small cups of water with a flower in each cup everyday. This is a popular combination. 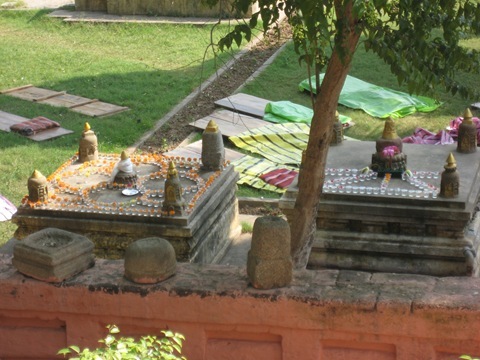 People would lay out the offerings in various shapes. 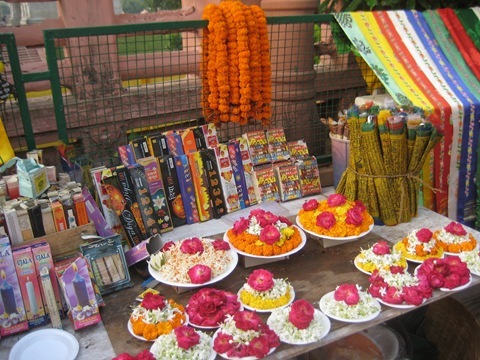 For people not bringing anything for offering, there are many people selling flowers, incense etc. 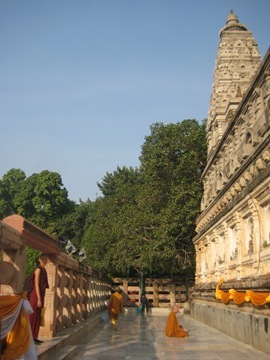 outside the temple. 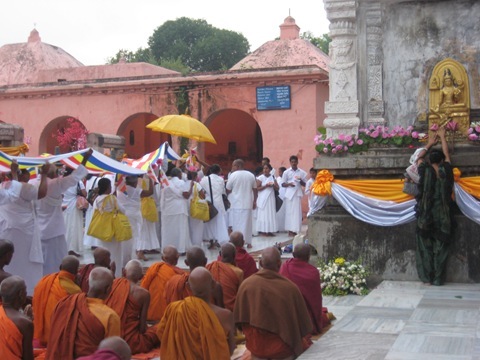 Nov. 10 would be the Annual Robe Offering Ceremony, organized by the Mahabodhi Temple Management Committee. 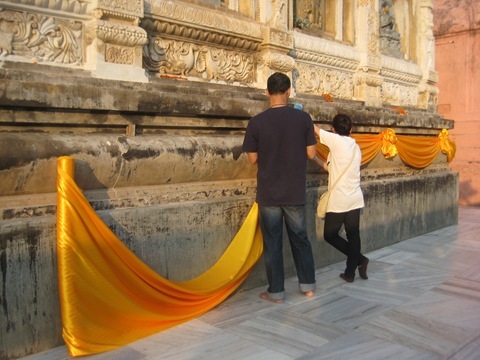 This year it was sponsored by Thai Buddhists, therefore a group of Thai people started decorating the site on the 2nd day while we were there. 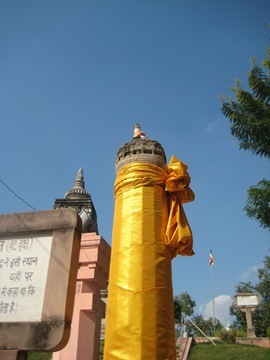 They brought a huge amount of textile, flowers and worked very hard for several days to make the site even more majestic. 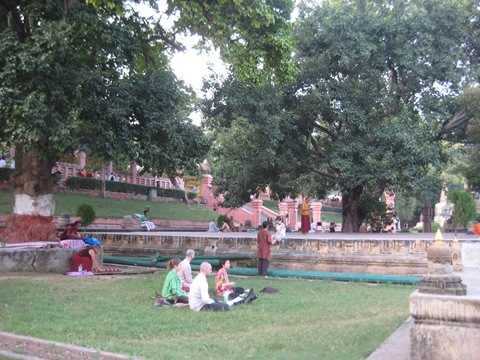 This is for sure the best place for doing practice among the 4 holy sites. 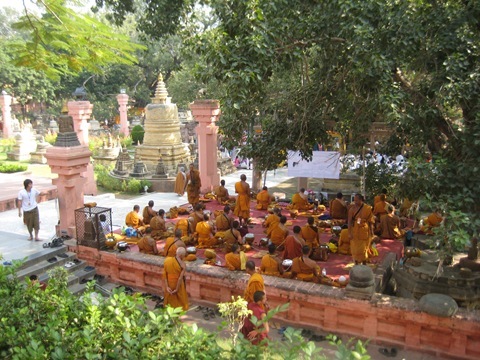 Numerous pilgrimage groups come everyday doing prayers and group meditation. 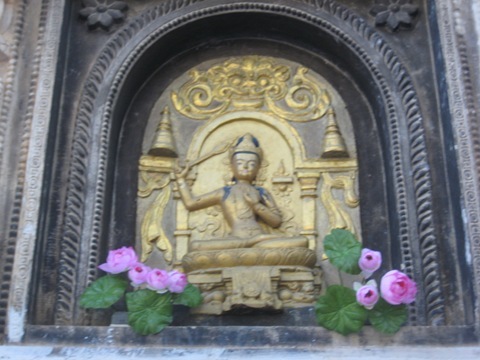 You can hear groups of Shravaka practitioners chanting sutra in Pali and Mahayana practitioners chanting sutras in their own languages, mostly around the bodhi tree, while the Tibetan and other individual practitioners doing their own practice in every corner of the site. The site is open till 9pm. 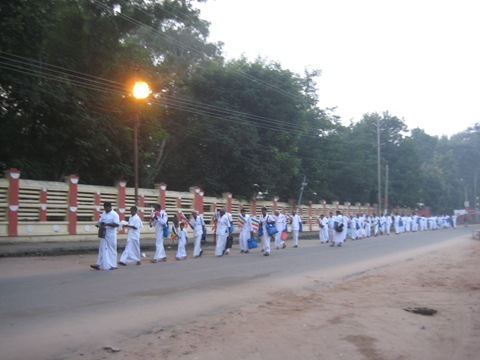 Despite it is dark after 6pm, still many people stay in the temple in the evening. 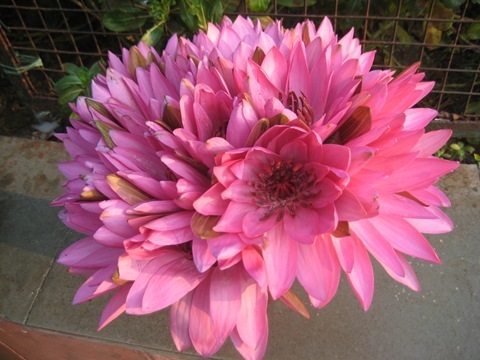 It is such a wonderful place where you feel naturally calm and joyful. 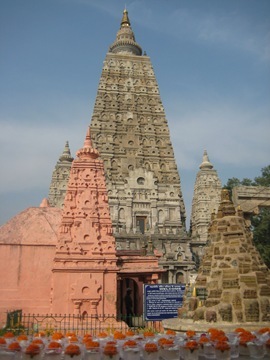 You rejoice in seeing people making offerings; you rejoice in listening to people chanting sutra and prayers; you rejoice in watching people doing countless prostrations; you rejoice simply at the fact that you can be in Mahabodhi in that very moment.